These bite-sized gems are grown in the Hudson Valley at Hepworth Farms, a certified organic seventh-generation family farm. Each colorful variety has its own unique taste, ranging from sweet and citrusy to robust and earthy. They’re delicious eaten straight out of the carton, and they make a great after-school snack. However, if you’re looking for a more grown-up way to enjoy these beauties, we suggest pairing them with a longtime local favorite: Salvatore Bklyn. Salvatore Bklyn’s artisanal ricotta—also currently on special at a great price—is handmade in Red Hook, Brooklyn, with milk from Hudson Valley Fresh. We’ve long been fans of this luxurious, creamy ricotta and find it’s the perfect topping for crusty bread, a crunchy cracker, or our housemade crostini. In this recipe, we let simple, fresh ingredients shine by pairing Hepworth Farms heirloom mixed cherry tomatoes with fragrant fresh rosemary and Salvatore’s rich ricotta. This perfectly sweet-tart, creamy, summery crostini is sure to delight kids and adults alike. Dice the tomatoes into ¼-inch pieces and combine in a medium size bowl with the olive oil, balsamic vinegar, and salt. Stir well to combine and let sit while you prepare the ricotta-rosemary mixture. Scoop 4 ounces of Salvatore Bklyn ricotta (half of a container) into a small bowl and stir in the chopped rosemary. 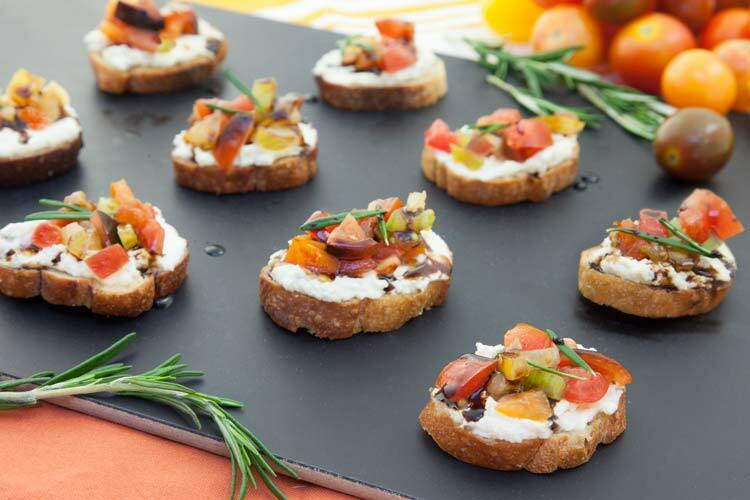 Spread a generous dollop of the ricotta-rosemary mixture onto a crostini and top with about a tablespoon of the chopped tomatoes. Drizzle with balsamic vinegar and serve.